Johnny 5 to tame Afghanistan in 2010? Analysis The MoD has now announced the winner of its "Grand Challenge" technology competition, which ended yesterday. The winning Team Stellar used a ground-crawling robot and two flying ones to unmask a range of likely urban-combat threats. "We are proud to crown Team Stellar the winners of MOD's most prestigious competition for battlefield innovators," said the minister for military kit, Baroness Ann Taylor. As it turned out, the Grand Challenge turned into a contest among robots, but this wasn't part of the rules. All the MoD wanted to see was a way of locating common threats - gunmen lurking in ambush, snipers, roadside bombs, armed pickup trucks etc - in built-up areas, without sending in troops on the ground. However, nobody could come up with a plan for a miraculous through-buildings scanner beam or anything - certainly not within the available funding - and so the Grand Challenge became a robotics compo. This process may also have been encouraged by the fact that the Challenge, despite much waffle regarding RJ Mitchell and other British historical themes, was clearly modelled on the rather larger-scale American robo-vehicle events of recent years. The US contests, run by blue-skies wacky-notions agency DARPA, aren't expected to produce immediately useful kit, but rather to help in exploring which ideas are feasible for the mid-to-long-term. They also develop technologies which could be useful for many tasks - for instance the precise laser-radar scanners used on many DARPA robo-vehicle contenders, which can give a computer a useful picture of what's around it far more simply than a visual camera can. Even so, the day of the unmanned supply convoy may never come, and the day of the autonomous droid tank seems further off still. The UK MoD takes a different stance, arguing that the Grand Challenge technologies "could be in use within 18 months", and that government funds were handed out in an attempt to get battle-winning kit to our troops quickly, rather than map out the possibilities of coming decades. This seems truly foolish. If you want to spend £10m to help out our troops ASAP, there are literally dozens of things you could buy off the shelf which they'd love to have and don't - usually quite boring stuff like off-road vehicles which actually work off road, heavy weapons, desert kit etc. They might even spend the cash on language courses or pay rises, so as to have more people there and be able to achieve more with them. Our people in Afghanistan already have small recon drones and bomb-disposal robots, in fact - and that's all that Team Stellar fielded. 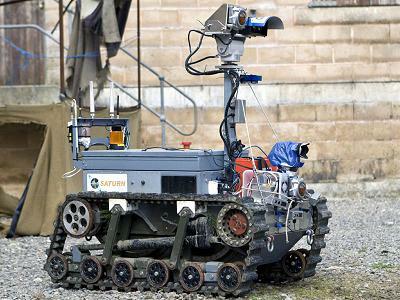 If it made sense to recce towns using ground robots, they'd be doing it. They aren't, probably because real Afghan villages have curious inhabitants with kids, as well as nasty Taliban ambushers, and an unarmed robot on its own would probably be pushed over on its side within minutes of entering one. Team Stellar may have some special sauce in their control station, but it's likely to be heavily dependent on the ground robot - and thus likely to be more than a tad pointless. It wouldn't be a surprise to find that Team Stellar actually won the trophy simply because their human operators were better or luckier at spotting the make-believe threat actors in the tests than the other teams; not because their technology was any better.